Step 1 Cut the shallots in half lengthwise and peel them. Place the shallots cut-side down. Slice lengthwise into about one-eighth-inch wedges. In a small saut? pan, melt 1 tablespoon of the butter over medium heat. Add the shallots and thyme and season lightly with salt and pepper. Reduce the heat to medium-low and cook gently, stirring often until the shallots are caramelized, about 10 to 15 minutes. Remove from the heat and set aside. Step 2 Heat a cast iron or heavy-bottomed saut? pan over medium heat. Add the remaining butter and swirl in the pan until it is melted. Place the two slices of bread in the pan and toast for a minute or two until just beginning to color. Divide the cheese evenly between the two pieces and top with the shallots. Step 3Place the pan in the oven and cook 5 to 6 minutes until the cheese is melted and the bread is golden and crispy. Remove to a cutting board and carefully assemble the sandwich, placing together the two slices of bread. Cut in half on the diagonal and serve immediately. In Recipes-list.com we have selected the most viewed recipes from category - Sandwiches Vegetarian . Enjoy the best recipes specially selected for you! 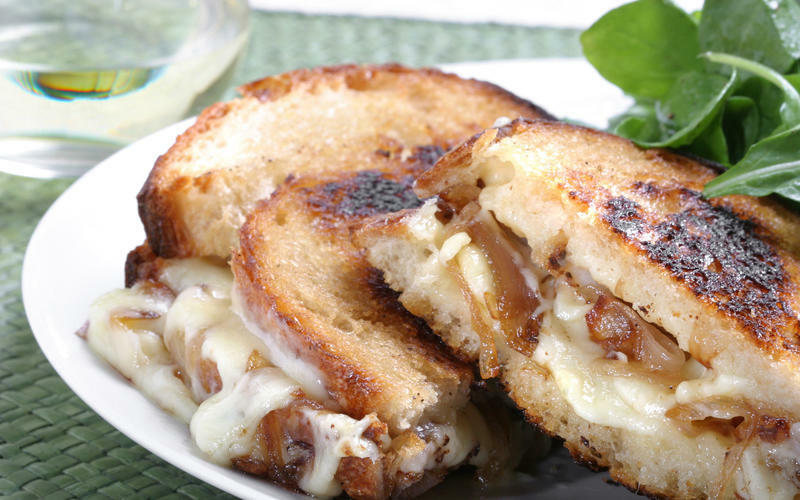 Lucques' grilled cheese with shallots is the right choice that will satisfy all your claims.